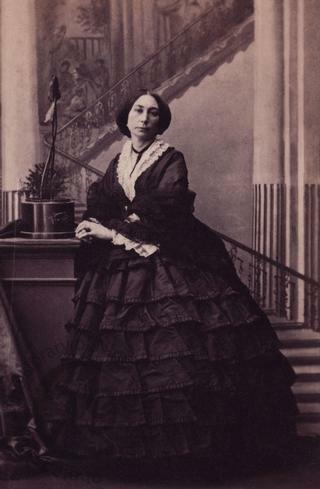 A carte-de-visite portrait of Lady Charlotte Schreiber (1812-1895). Born Lady Charlotte Elizabeth Bertie in 1812, she was the eldest child of the 9th Earl of Lindsey. She married, firstly, only three months after she met him, Josiah John Guest, the great ironmaster of Dowlais Iron Works in Glamorganshire. Although he later gained a baronetcy, at the time of the marriage the match shocked London society. Not only was her new husband a great deal older than her, he was also a dissenter and even worse, 'in trade'. The couple had ten children. From an early age, Lady Charlotte was a devoted linguist – as an adolescent she had taught herself Arabic and Persian – and when she came to Dowlais, she set about learning Welsh, which greatly endeared her to the locals. Her pioneering three-volume English translation of the mediaeval Welsh tales she called The Mabinogion became a classic of its kind and is still in print today. After the death of Sir Josiah Guest in 1852, his widow married in 1855 her son Ivor's tutor, Charles Schreiber, who was fourteen years her junior. For fifteen years Lady Charlotte Schreiber ransacked Europe to form a famous collection of china. The English portion, consisting of 2,000 pieces, she presented in 1884 to the South Kensington museum (today the Victoria and Albert), where it is still known as the Schreiber Collection. Photographed by Camille Silvy of London on 15 July 1861.